Hope elephants Rosie and Opal are the inspiration for The Children's Museum & Theatre of Maine's upcoming production of "The Road to Hope: An Elephant's Story." 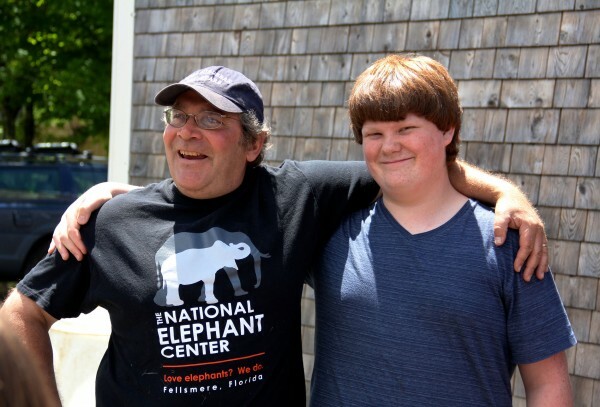 Jim Laurita, founder of Hope Elephants, stands with Aiden Davenport, who will play Jim in the Children's Museum & Theatre of Maine's upcoming production of "The Road to Hope: An Elephant's Story." 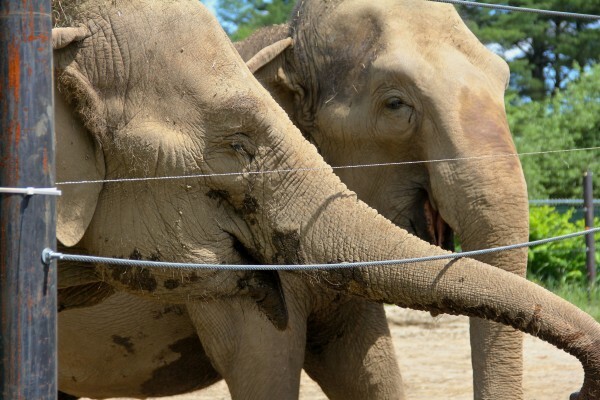 Brothers Tom Laurita (left), played by Charlie Rooks, and Jim Laurita (right), played by Aiden Davenport, work with retired circus elephant Rosie, played by Rosa Kull, in a scene from "The Road to Hope: An Elephant's Story." Dr. Jim Laurita, played by Aiden Davenport, works with Hope elephants Opal (left), played by Sidonia Summers, and Rosie (right), played by Riley Mayes, in the Children's Museum & Theatre of Maine production of "The Road to Hope: An Elephant's Story." PORTLAND, Maine — When Reba Short, theater and artistic director for the Children’s Museum & Theatre of Maine, read about Rosie, a retired circus elephant who lives in a sanctuary in Hope, Maine, she knew she’d found a story for the stage. During her performing career, Rosie was pushed against a circus car by another animal — bullied, according to Short — and injured. But she found comfort from a juggler in the circus, Tom Laurita, who years later would found Hope Elephants, the sanctuary in Hope. From Rosie’s story, Short wrote “The Road to Hope: An Elephant’s Story,” opening Wednesday at The Children’s Museum & Theatre of Maine. 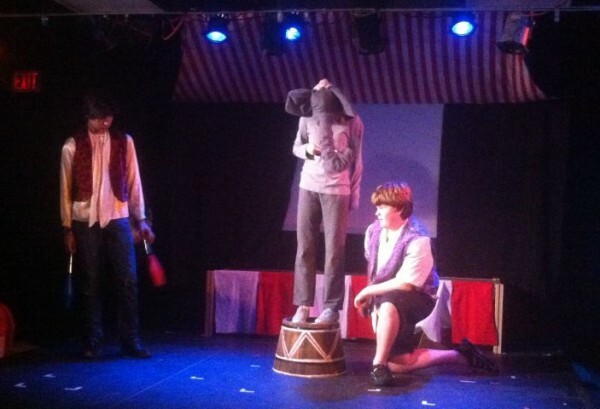 Clad all in gray, with big, floppy ears and a trunk, 14-year-old Riley Mayes lurches and sways across the stage, dragging a chain behind her as she portrays Rosie during her circus years. To prepare Mayes and the other actors for their roles, Short spent a day talking with the kids, ages 8 to 16, about their experiences with bullying. “I had them all imagine that one kid in their class who is always getting in trouble, that one kid who’s really mean,” she said. Then the kids talked about why they chose that person, and why they thought he or she was so mean. A free performance of “The Road to Hope” is scheduled for July 22 in the public amphitheater outside the Camden Public Library. For tickets or information call 828-1234 or visit www.kitetails.org.